"Twilight" is the keyword of the seasonal and sumptuous treat. The Holiday Twilight Tours are almost here at the San Simeon structure, which'll be delightfully decked-out over several weeks. HOLIDAY TWILIGHT TOUR, which runs over select dates beginning the day after Thanksgiving 2018. You'll behold the castle's exquisitely manicured grounds, of course, as well as "the grand social rooms of Casa Grande" wearing all manner of holly, swag, and bows. 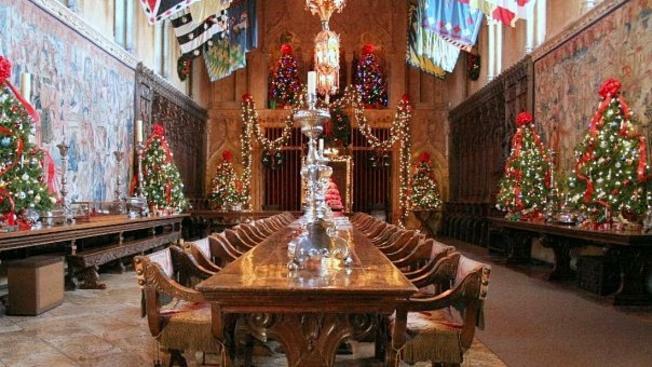 It isn't all about the yuletide visuals, however, for your guide will tales to tell of Hearst Castle Christmases gone by. The time for all of this twilight-y splendor? Five in the evening, which means you may just get to experience one of those aforementioned pinky-purple veils, if the sky and sun are feeling particularly artistic on the day of your visit. Prices, dates, and more merriment? Travel to this page first, before traveling to San Simeon, for one of our state's most historic and seasonal sights.